Last night I fortified with a bit of vino then tackled the ironing. It took forever. Okay, may be just a few minutes, but they were really long! I told the Mr. what I was doing. He checked for a full blue moon. Ha. Ha. Probably deserved that though. I finished one strap too. 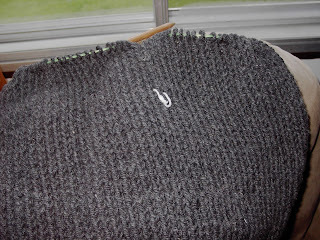 Funny how a tightly knit, 5st garter stitch will spiral. I like it though so I am leaving it like that. 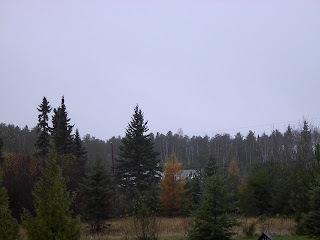 This morning a nice storm moved in to snow/rain/ice pellet us. Winter. Yay. I finally figured out what I am going to carve on our pumpkin and it is really dang scary. Show you tonight. Well my buddy is home, but still not quite right. So we are switching his meds to see if that is what is causing the problem. It's all fun all the time around here. Especially at 3:30am when I discover what projectile pooping is all about. Yeehaw. If I haven't said it before, I heart my vet (Dryden Veterinary Services - Dr. Clayton Schneider - if you are in the area). He is amazing and he has been kind enough to give us a break on some of his time spent doctoring Apollo. He has also done everything he can think of to help him get better. He's going to be frustrated about the pooping thing and I bet there will be time spent on the internet trying to figure out what's going on. So I am putting up a couple of links instead of photos and or anything I have done that could possibly be of interest that doesn't include yucky things and or bleach. 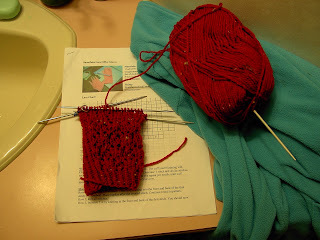 Norma's fund raising for the Red Scarf Project has stalled. If you have a bit of spare change or even some paper type cash laying around, it wouldn't hurt the fund raising thing to get some. The vet kind as he is, has most of ours, but I did find a couple dollars worth of yarn money I don't need to spend on more yarn I can't find time to use, laying around. You can too! Thank God I got me a job. If ever there was a time to have more money coming into this house without force the Mr. into working every day, this is it. Merry Knitmas! contest (scroll down for the English translation). Angela told me about the contest and it looks pretty darn good. Love that first prize! 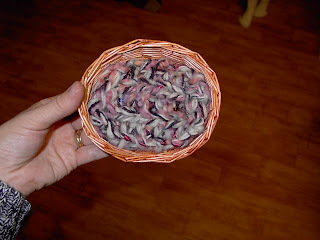 Now, I think I will be going stash digging and attempting to get the membrane to work the design thing so I can enter. Apollo has recovered and I am off to pick him up this morning. I am so relieved! None of us thought he'd pull through. We were all hoping, but he was so bad off that we had to have that talk between ourselves and with the vet. Fortunately he's a fighter and is even now driving the vet crazy barking to get out of his kennel. My buddy. Other good news, I start training on Thursday and Friday so I will be the one foolishly grinning at the front desk when you first walk into the Municipal Building. I figure it will probably take me a bit to become a surly civil servant. I also finished Changing Lace. 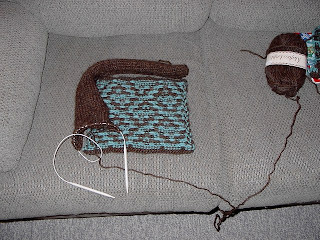 I haven't blocked it yet so more photos and the pattern once I've gotten that part done. Now since Halloween is Wednesday, time for some last minute knitting on Girly's Halloween bag. 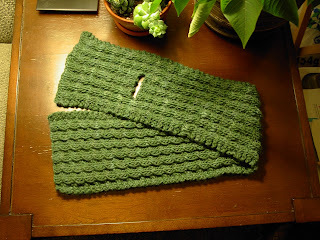 I picked out the crochet seams and handles, finished one side and have started the other. Then to line it, seam it and add some proper handles. ETA: I forgot how big Flickr's medium size is so I had to fix the photo. Yesterday was a very busy day so busy that once the errands were done, I realized it was Friday. Of course by then poor Apollo was feeling so bad we had to take him to the vet. He ate too much on Wednesday afternoon started hurling that night and most of Thursday. 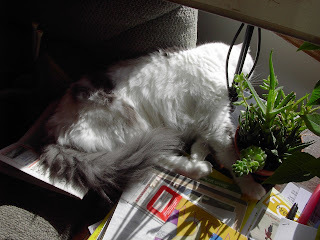 Friday I couldn't get him to take his meds and by the afternoon he was in full Addison's crisis. So off to the vet for fluid IVs and cortizone shots. This triggered the talk about what quality of life we want for him. I wasn't in much of a mood to talk yesterday and I am hoping that the news from the vet will be much better today. If I don't hear from him before 11:00am, it means Apollo is doing well and it's all good. We may have to try a different kind of medication though. Send happy dog type thoughts, would you? Also happy traveling thoughts for Girly's best friend who is moving to Southern Ontario tomorrow. She will be missed. There is good news around here though. My good camera is back! Hello macro, I have missed you so much I have forgotten how to use you. 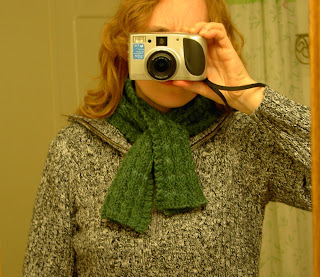 Now you can see my Changing Lace scarf a little better. Blocking will open it up more. The right side. See those sort of circles? Snow! It keeps coming and going. No snow on the ground yet, but once it starts, that's it. Winter is here. Maybe I should take a how to draw with a mouse class. Mouse Arts. 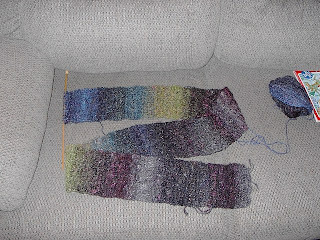 The Noro scarf is nearly done. I've had to do a bit of juggling between ball 3 and 2 so I can end on the same colour I started. Ball 3 has no green in it though even though it was from the same dyelot. I should have looked more carefully when I bought it. I like it anyway. The bag sides and bottom are trucking along. The best thing about mosaic knitting, is that the backside lets you pretend you stranded it too. Mama is busy this morning. I take good pictures too so she said I could talk to you today. 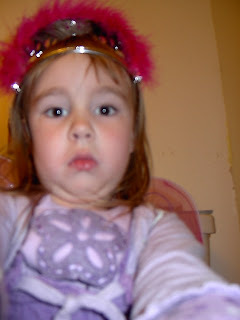 See my bee-u-tee-ful butterfly wings and my tiara? I get to get all dressed up in six more sleeps and go trick or treating for candy and stuff. She's still knitting on that scarf. See it beside the laundry? Mama says someday the laundry is going to do itself, I think she's hilarious. Mama says she has to get the house cleaned up because she finally got a job and can't stay home and pretend that the house will get cleaned up one of these days anymore. Scarf Central, speak up please! Operator [Remember Ernestine? Use that voice]: Gracious, Maude will that child ever put down the scarf needles? Maude: Probably not, she's got a way to go with that scarf yet. What do you think of it Shirl? Shirly: So far, so good. She's got a thing for making things reversible, doesn't she? Operator: I've noticed that. Doesn't seem to mind wearing things that aren't reversible though. Odd child. Oh, hang on girls someone's trying to phone out. - 2 skeins Naturally 12 ply wool (7 wpi) 152m/166yds. 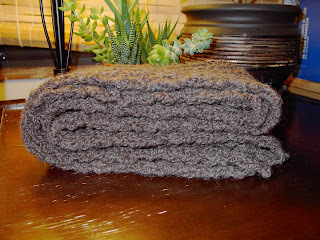 If substituting, make sure your yarn has a lot of body and spring. - 1 pair 8mm (US11) knitting needles or needles that allow the scarf to pull in and remain soft with some drape. 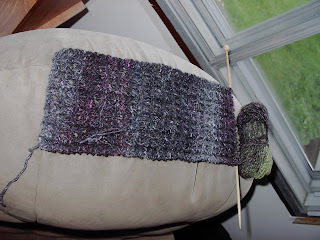 Repeat Rows 1 - 10 to desired length. Width - 13.5cm/5.25”, Length - 207cm/81.5” (just under 7’ if you use every bit of both skeins) before blocking. I didn’t take gauge before starting. 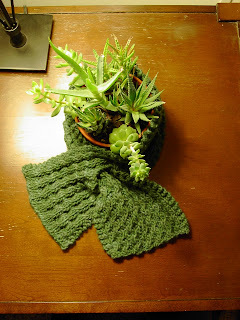 Using thinner yarns and smaller needles will give you a narrower and shorter scarf. 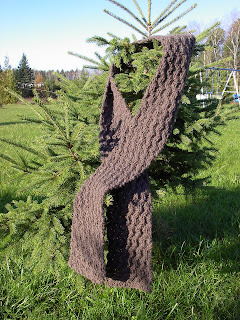 Your needle size should be a few sizes larger than the recommended in order to keep the scarf from being too stiff. The recommended needles on Naturally 12 ply are 4.5mm to 5.5mm (US 7 - 9) and I used 8mm (US 11). Pattern written by Dorothy Broderick - please don’t distribute without permission. You may not sell this pattern, but you may sell items made using it provided you agree to donate a minimum of five dollars of the profits to your local Heart Association. I finished the wedding garter on time and I love how it turned out. 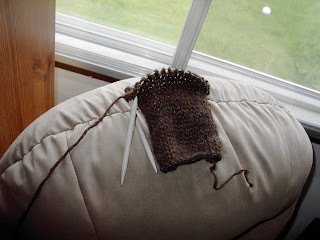 Although if I was to do this stitch pattern again with beads, I would place them in the knit row below the one they are in and that way the bell shape would be more defined. The wedding was beautiful and my friend is very happy which makes me happy. Her new husband loves her to bits and that is the absolutely best part. 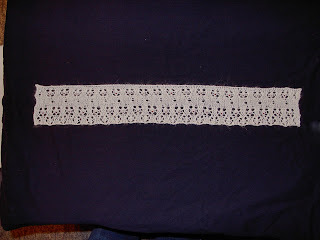 Since this is a wedding garter, I won't be sharing the pattern. That way it will be her designer exclusive. ;) Don't that sound all fancy! 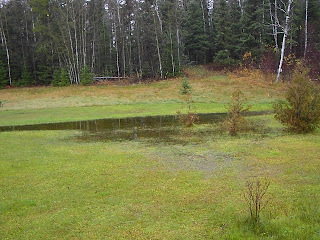 It's a wee bit damp around here. 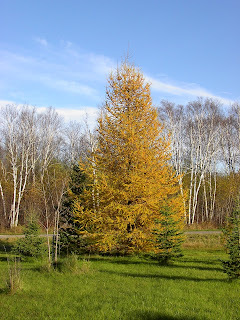 A bit of colour still shows, but for the most part the leaves are gone and winter is showing her barren fingers. 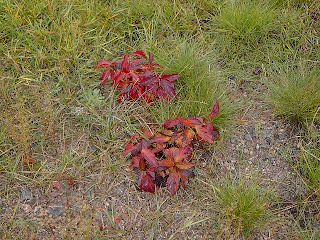 A splash of scarlet near the drive. The biggest part of the scenery though are these. Pools everywhere. If we get a lot of snow this winter, things are going to be pretty interesting come spring. In other news, the garter for my friend is finished and blocking. I knew that thing was used for something, apparently it's for blocking knitting. Now I just need to figure out what is the purpose of the triangular thing with the smooth, but holey bottom. 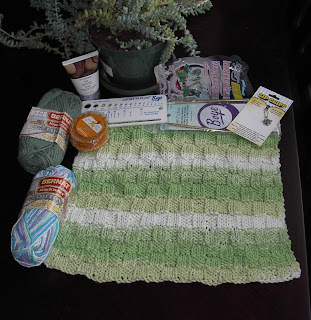 The knitting part of my short hiatus. 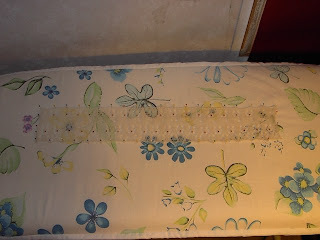 A mattress for Girly's kitty bed. I wanted to use up scraps and didn't think it would be all that hard. Apparently it is. 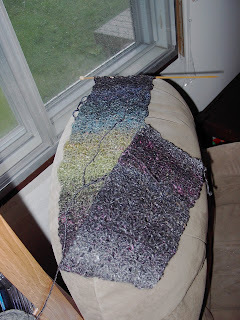 I had to fiddle and add more and more yarns on bigger and bigger needles just to get my yarns to go far enough. 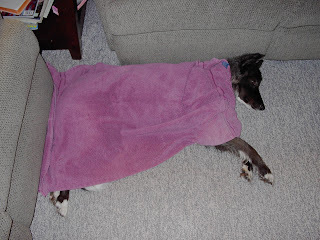 I had to do the same for the blankie. I do like how this looks though. 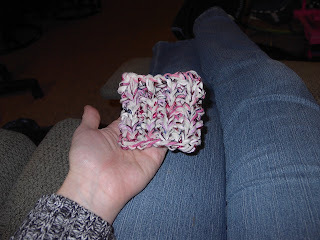 A purple/pink/white dishcloth cotton, Berroco's Mosaic FX, and two white sock yarns held together. I finished the second side to my Balance Bag. I did the first side quite a while ago and put it down for later. Later took a good bit to come along. It's time now though. I cast on for the ends and bottom right away. If I wait until later, who knows what year it will get done. 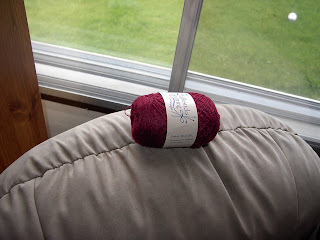 While in Thunder Bay, I dropped into Threads in Time and wanted to buy everything chose this pretty laceweight yarn. There was so much there it was hard to decide what I wanted and if I'd had more money, I think I would have had a hard time packing everything back into my bag. Of course I could have just bought another bag. One of these days I am going to get there and be able to go nuts. In the meantime, good thing there are beauties like this to take home and love. Someone else got something to love. I got that green chew toy/ball for Apollo on Saturday before I left. It squeaked then. On Tuesday night when we got home, no more squeak. He had chewed on it so much that he flatten the thing that squeaks. He hasn't left it alone yet. I go away and Blogger is doing alright. I come back and I can't upload pictures due to some error thing. We made it there and back very well and I even made it to the yarn store. I had no money to spend due to things like not having a job and all, but I got to pet many things and once I do have money, I'll know what to have Lynn at Threads in Time send me, post haste! Also I didn't get much knitting done. Due to things like driving [only 391 deer this time], being alone in a hotel with a three year old for a night and day, entertaining said three year old until Daddy's plane came in and not having any projects on the needles that can be knit in the dark. Not one. I need to remedy that one of these days. Girly and I are taking off for a couple of days to pick up the Mr. [the doctors figure that his Dad's heart attack was caused by a blood clot and not cholesterol so he may not need a bypass] so I am leaving you some pretty Autumn colours. 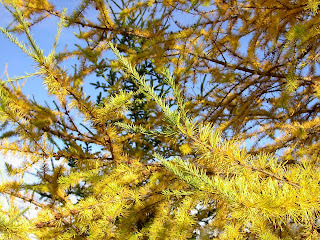 The Tamarack in our front yard is bright and beautiful. 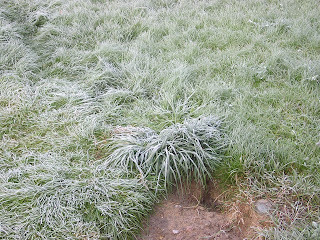 Jack Frost paid a visit with a solid frosting that took most of the morning to melt. Must. Finish. Must. Knit. More. 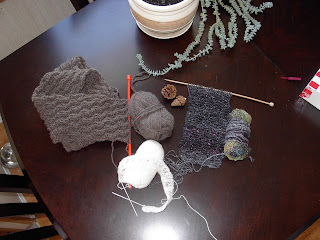 It seems that one thing off the needles makes me want everything off the needles all at once. So I am knitting here and there and everywhere on everything. Sadly, I appear to have gotten nowhere. The pine cones are drying out and opening faster than I am knitting. Under Water is taller than I am and still a ways to go since I am going to knit on it until I am so close to out of yarn that I have to find a neat way to end it. Someone helped me measure it by holding the cast on tail nice and tight. 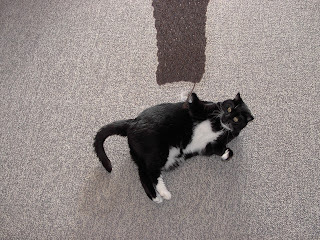 Note the whirling paws'o'death. Speedy and scary enough to pin a 40lb dog in the corner and make him cry until he gets rescued. 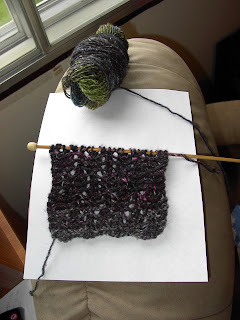 "Rock a b'y [she is half Newfoundlander] baby..."
I changed my mind on the Noro scarf. 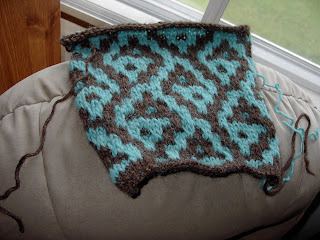 I liked the other stitch pattern, but I think it would look better in a less busy yarn. So I ripped it and started again with a different pattern. It's a challenging one with two different kinds of YO's and P3tog on every row. But I like it better and although it doesn't show in this part of the scarf, it will when the lighter colours finally show up. 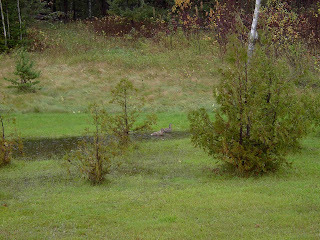 The weather has been so damp and chilly lately, that Wingnutty has been coming in with the shivers. 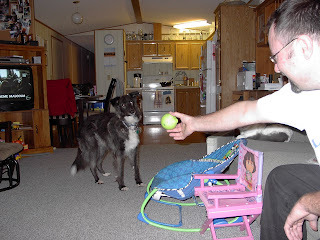 Big, tough, husky/border collie/terrier mix. More like overgrown, hairy Chihuahua. In more than one sense of the phrase. Thursday we packed the Mr. up and drove into Winnipeg. 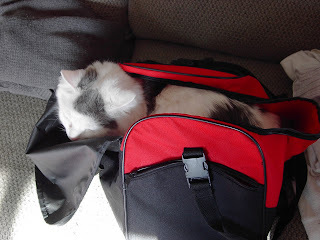 Someone was annoyed that he didn't get to stow away. I may have to get some yarn and make this cat a hideaway. This is what happens when I knit in the car in the dark. I have gotten as far as I can get with this right now. I have to wait for more yarn to come in and hope that it matches. Friday on the way home, I checked the mail and there was this. 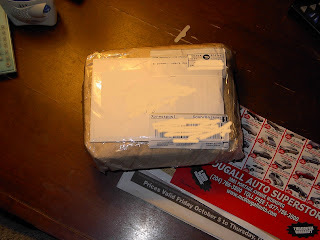 Our Dish Rag Tag box finally made it back to me! We had eleven people on our team and even though the rest of them had ten, we were not dead last. We also came close to beating a couple of U.S. teams. There is still one Aussie team that hasn't finished yet. Apparently their post is as slow as ours. The lovely Tania stuffed the heck out of the box! I was amazed at how many things you can cram in a Vegetable Thins box. Thank you Tania! The candles smell fabulous. I'm keeping one on my computer desk so I can sniff it often. I also stopped in to The Painted Sheep (Google Map) in Kenora and found some Noro Silk Garden in a colourway even I could not resist. Still not big on knitting with this stuff, but it does soften up quite a bit after a washing and the colours should be awesome once it's done. 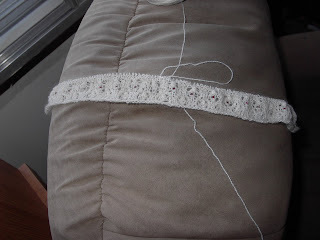 I'm doing a simple lacey rib since the yarn will do most of the talking. 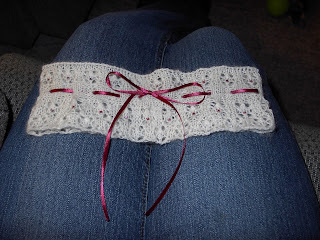 I also finally started on a wedding garter for a friend who is getting married on the 20th. Oy. I have to finish up the Snowflake Lace gloves too since they are for her wedding shower on the 14th. Then there is the rain. 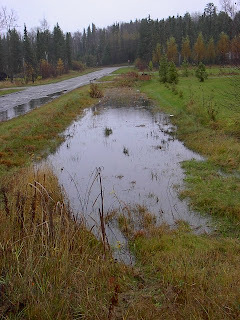 Since I am a Canadian, and we've gotten a lot of rain, I really must talk about it. Compulsively. To everyone who comes within earshot of my speaking range. Look! Ducks and the puddle is deep enough that they are swimming. Swimming! Paddling their little feet and not scraping bottom. Good Grief, Charlie Brown. I have many things to be thankful for this Thanksgiving (in Canada anyway) weekend. 1. My Father in Law is stabilized and able to have surgery when there is a bed available. Probably Tuesday, thank goodness he's in Newfoundland where the wait times are shorter than here. 2. My Mr. had overtime on this and his next cheque so we could afford for him to go to be with his family. Heck with paying things off. That pales in importance right now. 3. My family was able to jump in and help out with the pets and Girly so I could drive the Mr. in the Winnipeg to catch a early flight out. 4. That Ray was able to recognize what was happening and call for help before things got too bad for him to be able to speak. 5. That his friend was home and able to take him to the hospital fast enough to get there before his heart stopped. 6. That the emergency doctors and nurses were able to get his heart going again and have him stabilized within 24 hours and that the heart specialist and surgeon are available so soon. 7. That the Mr. and I didn't hit that deer that ran across the road and that it was the only one out of 41,348 to make the crossing while we drove by. 8. That we didn't get lost in one way hell Winnipeg. Thank you Google Map's Get Directions feature! 9. That the Mr. made it home safely and was able to talk with his father before heading off to sleep. 10. That I didn't get a job so I could drive with the Mr. to Winnipeg and bring the car home today so he could catch an early flight. Which means that he didn't have to wait until tomorrow or Monday to fly out. 11. That all of you jumped in and sent off the healing! Knowing that you are there helps big time. So many things that mean the world when the chips are down. If you haven't already, go tell your family you love them. Tell them everyday. Even if they make you crazy. Even if you haven't spoken for a while. You never know when you might not have them around and that chance to tell them is gone or that chance to talk one more time. Sometimes just knowing that you tried to bridge the rift and failed is far better than knowing that you never tried at all and now it's too late. I hope you all have a great weekend and see you Tuesday. I have to go sleep now, love you! My Father in law had a major heart attack this morning. It's really bad and if you can, send some healing whathaveyou out to Newfoundland for Ray we'd appreciate it. 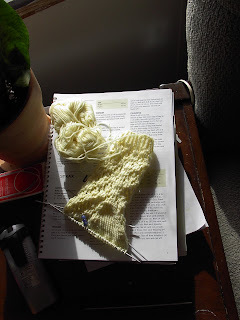 The new version of the Snowflake Lace Office Gloves is going well and I am nearly done with the thumb gusset. 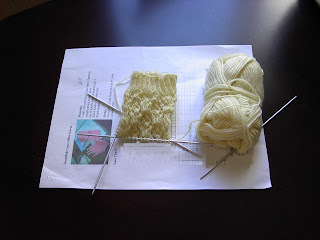 For sock yarn and lace patterns, this is going fairly quickly. Apparently this is a comfortable place to sleep. 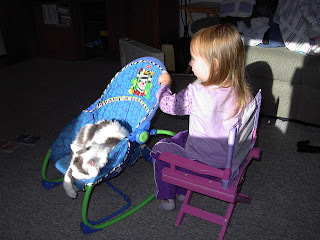 The sun is out again this morning, so Girly and I are going to play outside again. Hopefully it stays out for a while and we can have a nice long walk again. 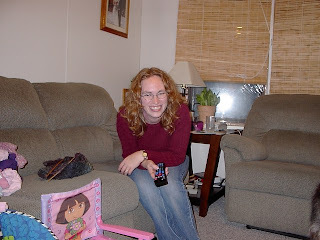 This time with the camera. Sometimes a modification just doesn't look right or fit right. Like this one. It wasn't showing the pattern as well as in the original and it had a bit of a sag at the wrist which I just don't like. Too bad, the red DK knits up much faster than the white-ish Australian wool. Maybe, perhaps Squeaky Weasel knew what she was doing when she designed it. Imagine that. Today is a sunny day and they've been few and far in between so we'll be outside if you need us. There are some very good things to this unemployed thing. Too bad we can't afford for me to be unemployed forever. Perhaps someday.